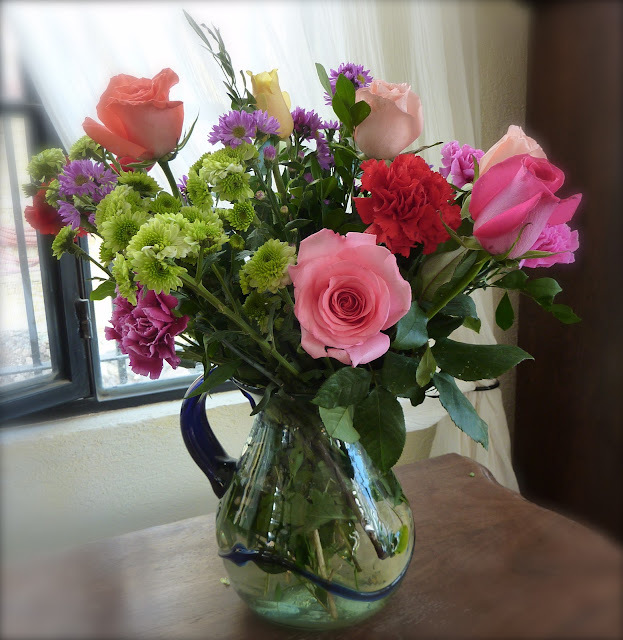 My heart dictated flowers were needed for the house. What is it about flowers. The colours? Nature at it's best? The aliveness? The calm energy they give off? Who knows ... a combination of many things I'm sure. Anyway, I wanted to share them with you. Today, while at an appointment in a more obscure part of town, I fell upon a junque shop! Yes, I must say, old patterns have surfaced. It's just part of me ... I love junque! With the studio being slowly on it's way to completion, I find myself pondering it's decoration. I want to have FUN there. I want to feel a sense of PLAY in the room when I walk in. Ever since I can't remember when, I've wanted a Gypsy Wagon. If I had a Gypsy Wagon I would paint it in incredibly wild and wonderful colours. Odd objects would appear everywhere. I've decided to transfer these longings into "By the Light". Colours I have chosen are as follows. Ceiling: Lime Green. Two walls: Vibrant Pink. Two Walls: Incredibly Rich Orange. Are you shocked yet? I'm so excited. This is going to be fun. Now, I am on the look out for 'reasonably priced' things to decorate. Today, at the little junque shop, I found the following. This is an old piece of punched tin. It will be fun to paint it (bright colours of course) and grace it with who knows what ... a photograph, a painting, inspiring words, a mirror ... it will evolve as I go. A couple of wrought iron frames will come in handy. This was once part of a street lamp. Picture re painted, bolted onto the wall in an appropriate place with a great big fat pillar candle in it. Brackets to hand just about anything. I also purchased a small four leg foot stool. Low to the ground with curvy legs, it will be my step up to the bed. I need to reupholster it. Lastly, a great box of junque. Ripe for making out of the box art pieces. While I hunted for fun stuff for the studio, progress was being made at Quinta de Luz. 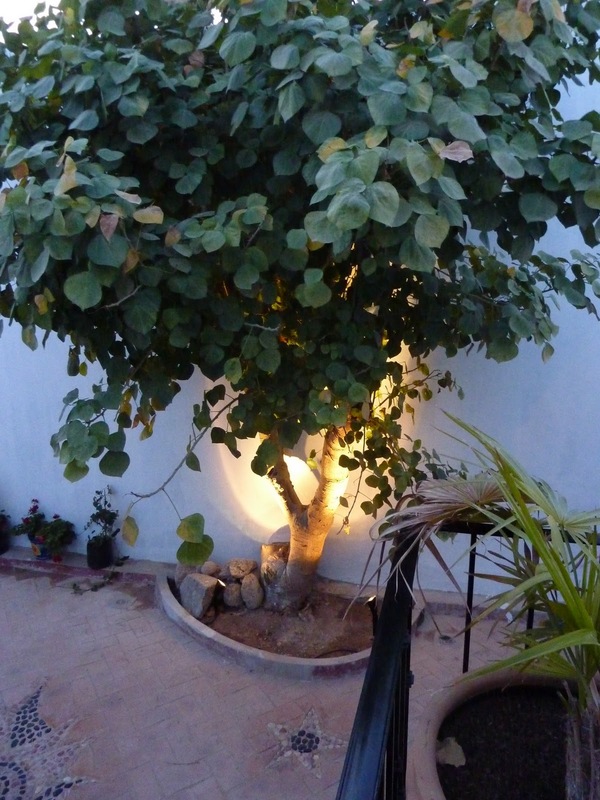 When I came home the electrical in the Jardin was completed. Now all I have to do is flip a switch on my terrace to turn the pump in the fountain on, the light in the fountain, and the lights under the tree. Outdoor plugs have also been installed to add outdoor lights. Is this not FUN? The sound of the water is very gentle and soothing. Beautiful at night. There is also a plug in at the base of the tree. I will be able to string lights up into its branches. Painting of the casa street wall will begin tomorrow or Monday. The colour I have chosen is called "Heavy Orange". I hope I love in when it's finished. Around the gates, and windows will paint trim of another colour. I still have to choose that ... have to see the orange on the wall first. Donna, where to start?? You have prompted me to realize that I need some indoor flowers in my life. Yes. Gorgeous. It looks like you hit the jackpot at the junque store! I can't wait to see the photos unfold as your special place gets Donna-ized. I know it will be amazing! And last but not least, what a lovely tribute to your parents. I think they are looking down and smiling with love and pride. The photo is awesome! Really special. Oh, and Muffy is back to her normal feisty self. Thanks for asking! Thanks for all that lovelyness Patty. I'm so happy Muffy is fine fine fine. What would we do without them. Meant to ask ... how's your new baby? I'll bet you haven't put her down! WOW so much to see in your photos today. The flowers were my favorite until I saw your lighted fountain. Your gardin is going to be absolutely stunning. As for your junk finds, I just don't have your creativity and imagination; for some reason I was last in line in this department. Can't wait to see the final results.